Less than half the price of the HTC Vive Pro, but with the same resolution. 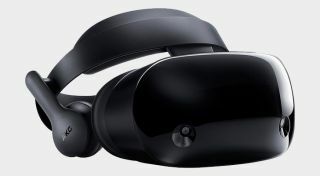 Windows Mixed Reality headsets are some of the best value VR devices around, and Samsung's HMD Odyssey+ model is the best Mixed Reality headset currently available. It dropped to $299 in February, but if you missed out on that deal, it has once again been reduced in price. The Odyssey+ was announced last year, and has two 90Hz 3.5-inch AMOLED screens, each with a resolution of 1440x1600. That's a higher resolution than the original HTC Vive (1080x1200 per eye) and Oculus Rift (1080x1200 per eye). It's the same resolution as the new HTC Vive Pro, which currently costs $800. The display also uses Samsung's 'anti-screen door effect' technology, which makes the spaces between pixels less visible. As for sound, the headset has built-in AKG-tuned headphones, so you don't need to try to fit your favorite headphones on top of the Odyssey+. If you're not familiar with Windows Mixed Reality, you can play just about any Steam VR title, as well as games listed on the Microsoft Store. It's a great way to get into VR gaming without spending a small fortune.